« Quince Vranja: why has my tree set no fruit? A Good Year for Apricots? British grown apricots are currently in the news with home grown fruit on sale in supermarkets this year. This is remarkable. Apricots are a difficult fruit to grow successfully in the English climate for a number of reasons and in particular because the trees flower so early – before the plums and cherries. Their early blossom is often damaged by a spring frost with the consequent loss of a crop. In Kent, this year apricot trees were in flower during early to mid-April and pollination over by the end of the month. A time when other fruit tree blossoms, such as those of early varieties of apples, were at risk when the temperature fell to – 3°C on Sunday April 26. The apricots escaped, it seems, and there is a good crop in Kent’s recently established apricot orchards. Amateurs growing apricots are also benefiting from this year’s weather and enjoying home grown fruit. The above picture of an abundant harvest of the Tomcot apricot is of a tree growing in a polythene tunnel tunnel in Adrian Baggaley’s garden near Nottingham, sufficiently far north to need some protection to fruit well in any year. 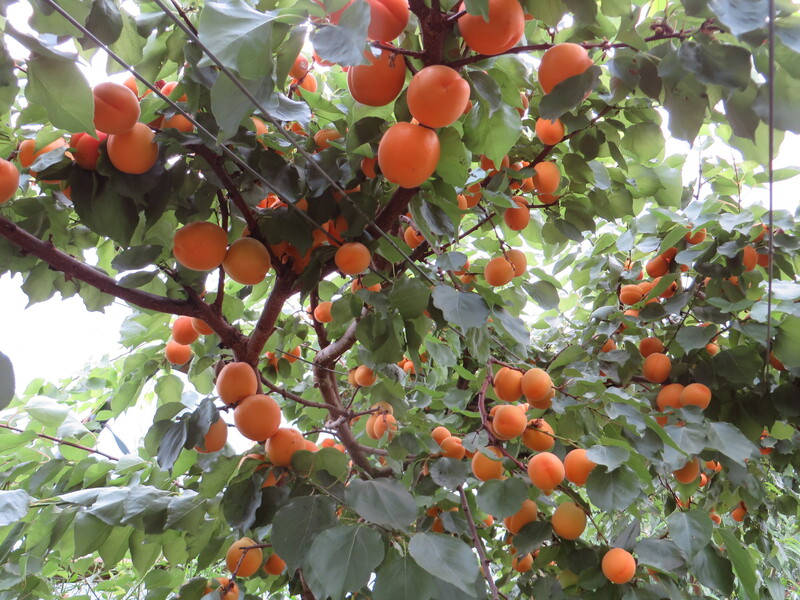 Are other readers experiencing a good crop of apricots – do let us know. And it would be interesting to hear from readers in warmer climates where apricots fruit readily and reliably. We just harvested the last fruit from our Flavourcot apricot here in Guernsey. It’s the first year it set fruit and it did really well this year (after last year when it was spectacular in blossom but did nothing thereafter!) Only perhaps 20 or so fruit but wonderful. We ate them grilled with honey and ice cream in one gloriously gluttonous batch. I would have to agree that it is a better than average year for growing Apricots in (southern) England. Tomcot flowered later than usual and this I think led onto a better than average set. However one recent curiosity, manifested in early July: all the fruit started dropping while it was still hard and unripe though of mature size. Whilst it ripened quite quickly in the fruit bowl, the damage sustained in dropping meant that the only option was to eat it on a daily basis as it matured. The soil is good deep alluvium loam while the dropping phenomena could also be observed on the local mature street trees by way of some of their leaves being shed as if it was autumn. The consensus of opinion is that dryness at the roots together with cool nights, (we have a forecast for just 9c tonight), has caused it. I grow Tomcot apricots in tubs. They are kept through the winter/early spring in a greenhouse as I live in North Wales. They are now five/six years old, one is grown on Montclare and one on Torinel rootstock. This year the Montclare tree flowered two weeks earlier than Torinel and the fruits were ripe a fortnight earlier, they were also considerably larger. The Montclare rootstock is by far the better rootstock in my opinion as I also have a further apricot, a Large Early apricot on St Julian A. The Montclare has so far fruited two years earlier than the other apricots and consistently outperformed them in terms of larger healthy crops of fruit. Two friends and a sister in law who saw and sampled my Montclare tree crop last year went home and ordered the same Tomcot/Montclare combination trees themselves. I have been experimenting with what will and what won’t grow here in North Wales since moving here 10 years ago. Plums,Peaches Figs, Apricots, Pears, Cherries, Cape Gooseberries (and ordinary gooseberries) in short keep them well drained frost and excessive rain free and most things will grow here! The annual rainfall here in the Vale of Clwyd is actually lower than Cardiff!